This year I have discovered the fun of going slow when rock crawling. So I was intrigued to see if it would still be fun on a micro scale? So its a little truck with big ambition, can it really deliver? Upon opening the box you find the Truck, controller and charger and some additional stickers and a basic set of instructions (No exploded diagram or other assembly instructions). 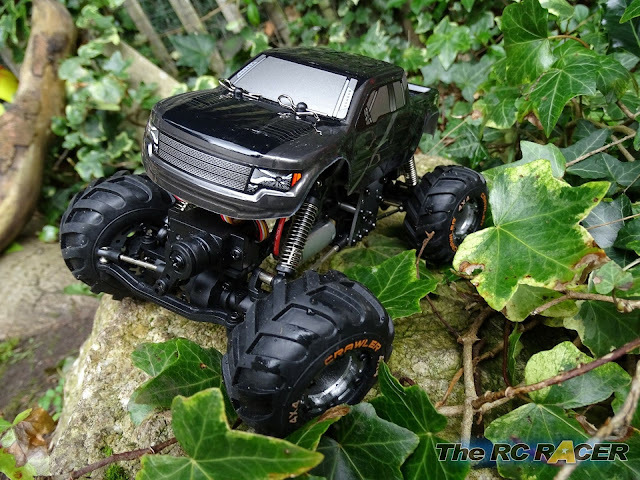 The shell is a very close representation of a Ford Raptor, and it is made out of polycarbonate and light. It is held securely in place with 4 body clips. 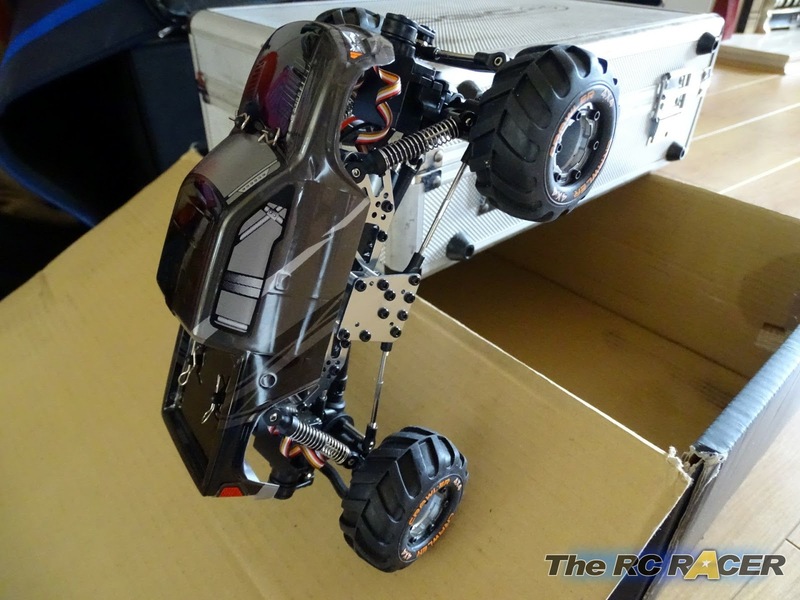 Once you take off the shell you can see the chassis. It is aluminium and it looks really impressive for something so small. 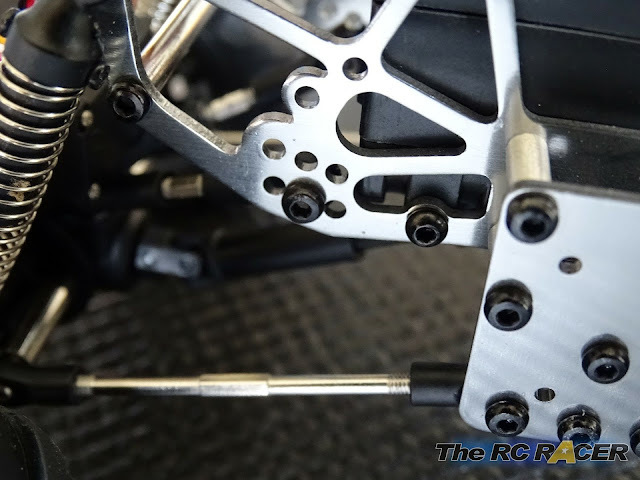 As is is made from aluminium so it keeps it all rigid and allows the linked suspension to do the hard work when trying to keep its wheels on the ground. 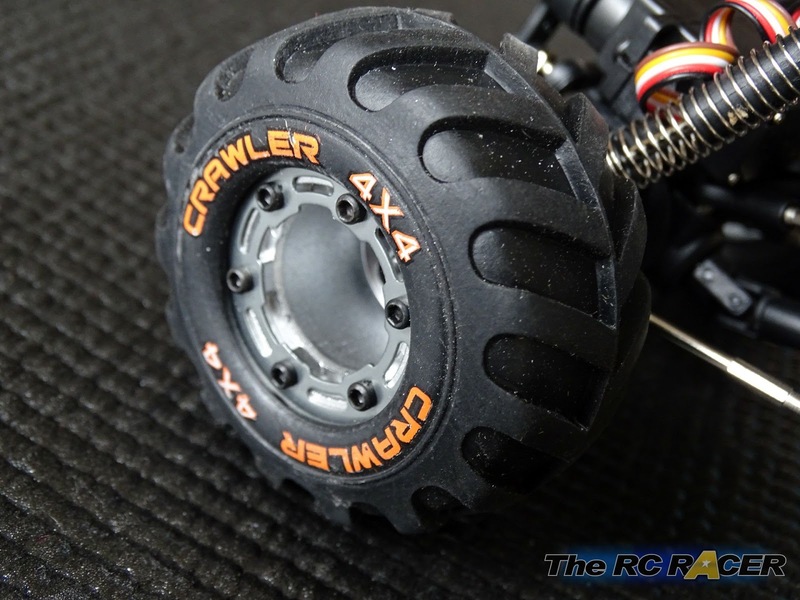 Talking of which the wheels are great, they seem to be mini beadlocks. The tyres are a v-pattern style, and they are soft and they feel grippy to the touch. The shocks are friction shocks but they move freely and as this car is slow and heavy they do not have the same issues as a race car would have. 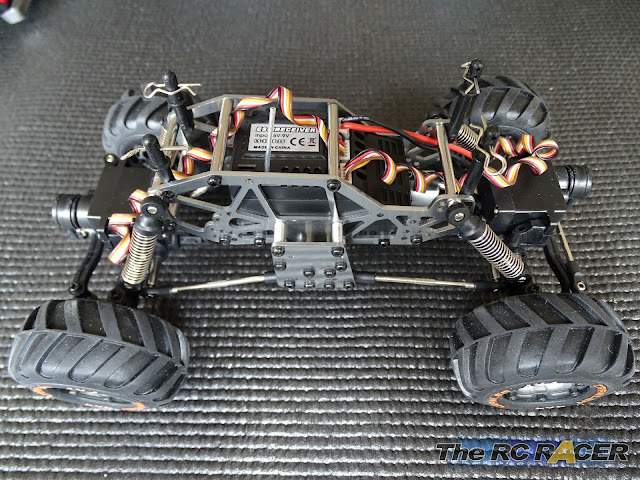 The axles are locked as you would expect for a rock crawler. 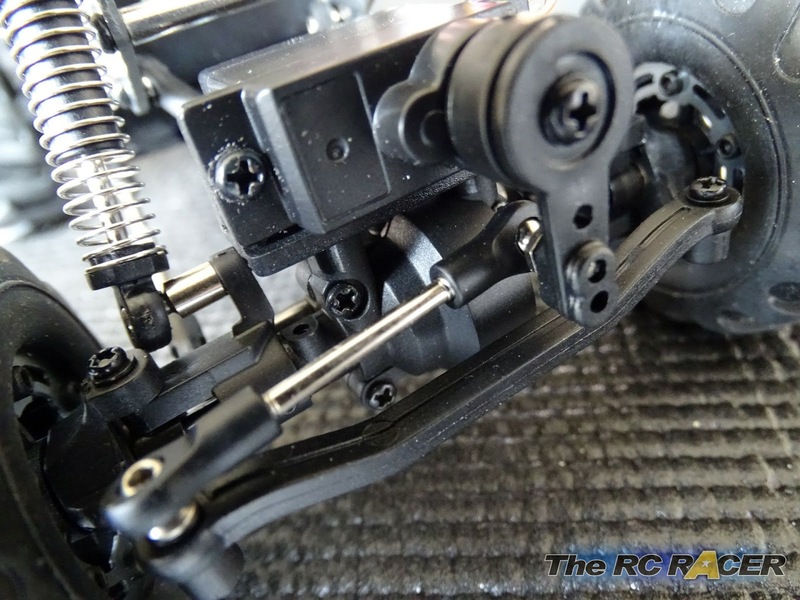 The big feature of this truck is that it has a range of steering modes so both the front and rear axles are the same with a servo mounted on both of them. Turning the car upside down you are able to see the drive train. The centrally mounted gearbox is actually pretty small and it drives the two drive shafts universals to the front and rear axles. Link-type suspension binds the shocks and axles together. you can adjust the upper links to tune the car. 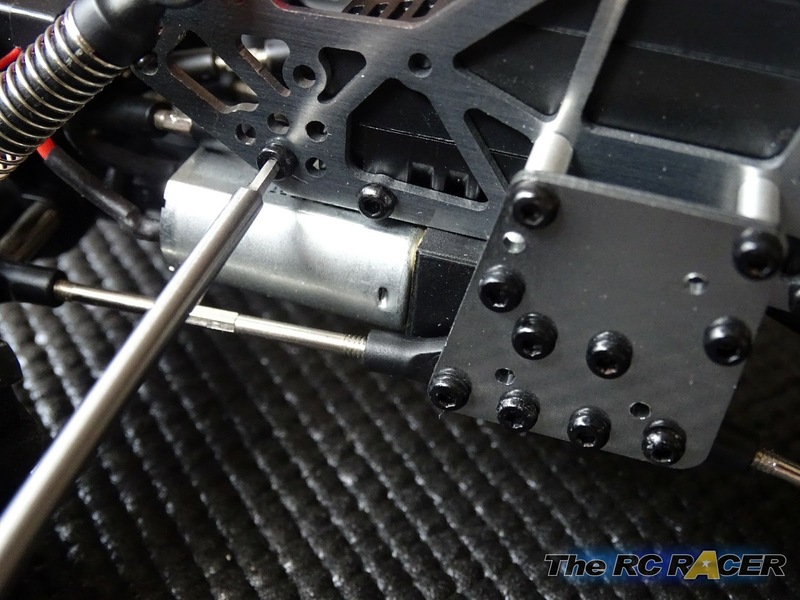 I did take the time to check over the screws in the chassis at this point. They are small screws that are threaded into ball ends and they could work loose, so I added a tiny drop of threadlock on the link screws to ensure that I would not lose any. Note: Do not over-tighten them in case you bind the suspension. The car does feel capable for small rock crawling, as you can see the articulation of the front and rear is impressive. 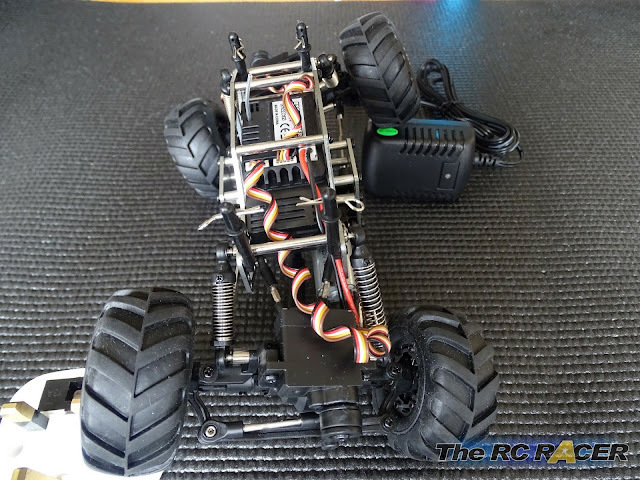 The Devastator runs of a 6.4v 500mAh lithium battery pack and it is all integrated into the 2.4ghz esc receiver unit. The plug on the charger is a euro 2-pin type but it also ships with an adaptor if you are in the UK or USA. The servos are small, but they seem to have quite a lot of torque. It must be noted that these are 5 wire servos not the standard 3 wire type that we usually see. The other main part is the controller. 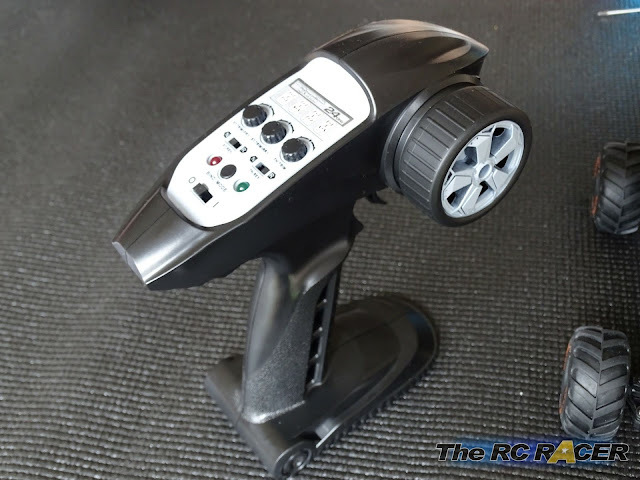 As is the case with most RTR cars it is a wheel type of transmitter... Honestly when will people learn that Sticks are best! ;) It is a good size and comfortable to hold. It takes just 3xAA batteries so it does not weigh a lot when in use. As you can see this transmitter has some standard switches for steering and throttle reverse. It also has trim buttons for the throttle and the front and rear servos. There is also an interesting button called 'Mode' this allows you to switch between a range of steering modes. Mode 1 just gives you front wheel steering. 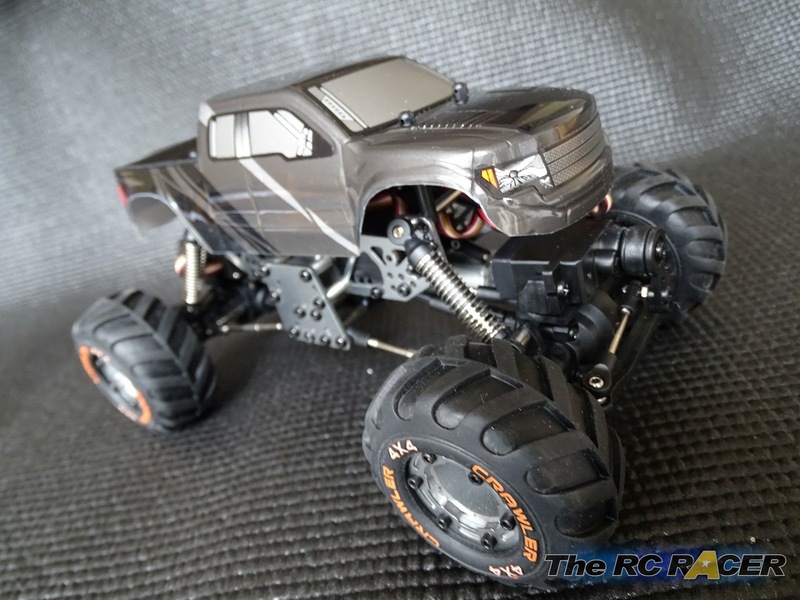 Mode 2 gives you front and rear steering, this dramatically changes the turning ability of the Devastator Monster truck. Mode 3 allows you to 'crab' the truck with the front and rear wheels turning in the same direction. Ideal to move around an obstacle but to keep the front of the truck lined up to get the front wheels where you want them. 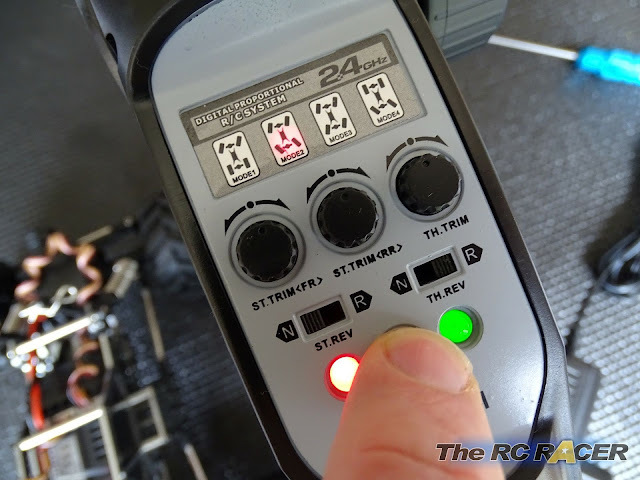 Mode 4 is rear wheel steering. Having all of these 4 steering modes available at the touch of a button is something that seems to be unique to the Devastator, and it is something that I am eager to try out! I put the car onto charge. 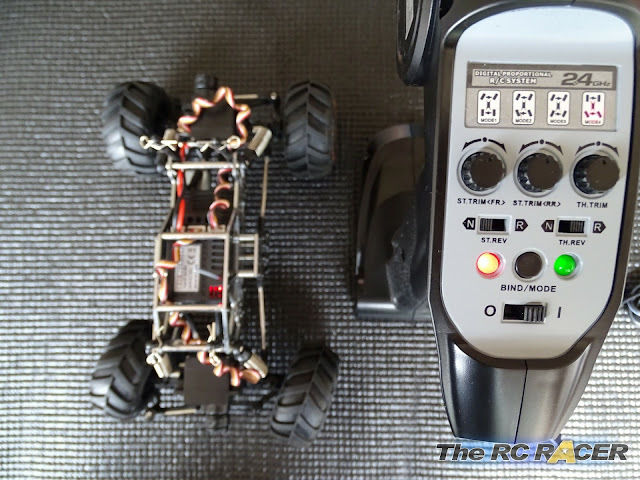 The average charge time is 30-40 mins but the first charge seemed much shorter (About 20mins). The charger light is initially red and then turns green once charged. As the rain was lashing down outside the Devastators maiden run was indoors around the lounge. 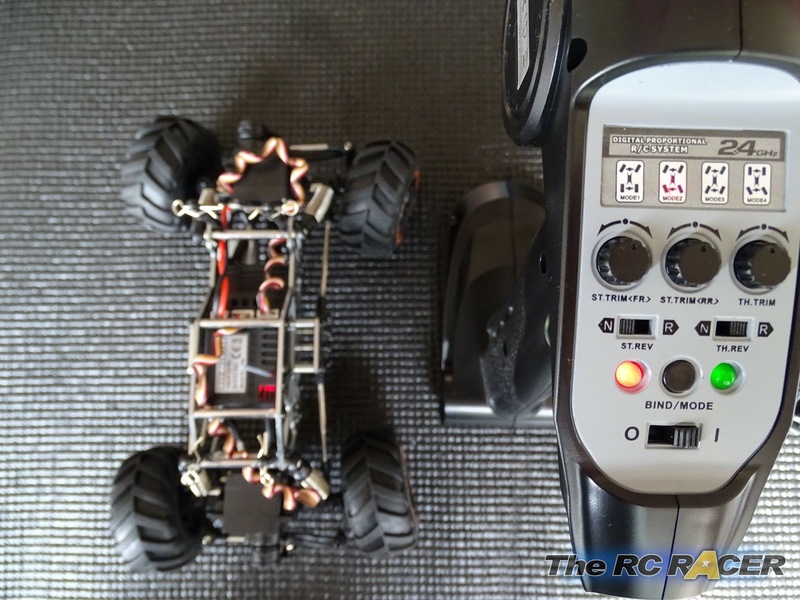 Thanks to it's diminutive size (190mm length, 125mm wide) there is always a lot of space to use the car. 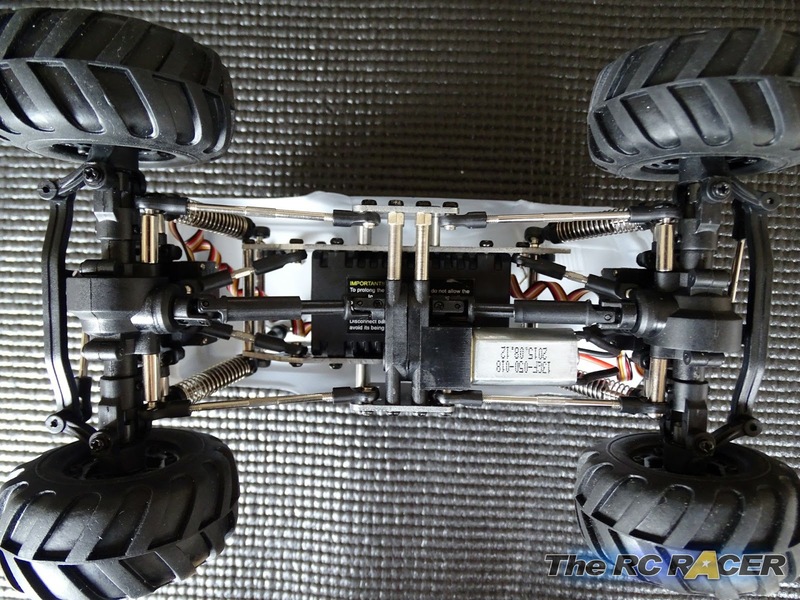 I trimmed the front and rear servo and just played around with the different steering modes. Mode 2 where the front and rear wheels turn in opposite directions was the setting that I initially stuck with as it made the turning radius much sharper. 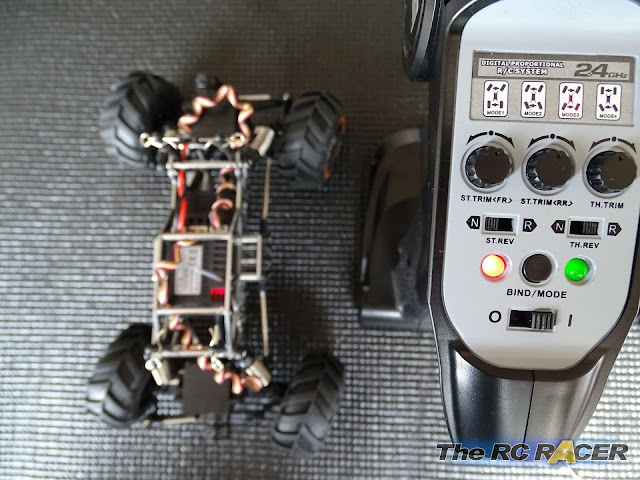 The steering speed itself is fine with the kit included servo's, they are quite responsive and they are proportional. The Devastator is about torque not speed so it has a high gear ratio to help it climb obstacles. This results in a truck that pootles around the floor as opposed to races around. The throttle is smooth, there is not a lot of range as it reaches its maximum speed quickly, but with a gentle amount of throttle you can slow the car down for more precise manoeuvres. After getting to grips with the Devastator I started to place obstacles around to assemble a makeshift track and to see how capable its climbing abilities would be. I was instantly impressed. 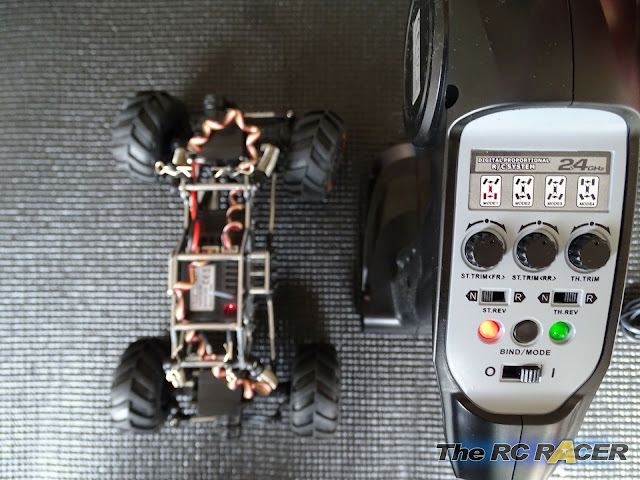 I had made a very steep incline with one of my pit boxes and it had no issues ascending up it, when it reached the transmitter case the sticky tyres just kept pulling the car up until it eventually rolled over. I then set up a course in the lounge and challenged my Son to see who could complete it in the quickest time (he won). We ran the battery down trying to beat each others records. 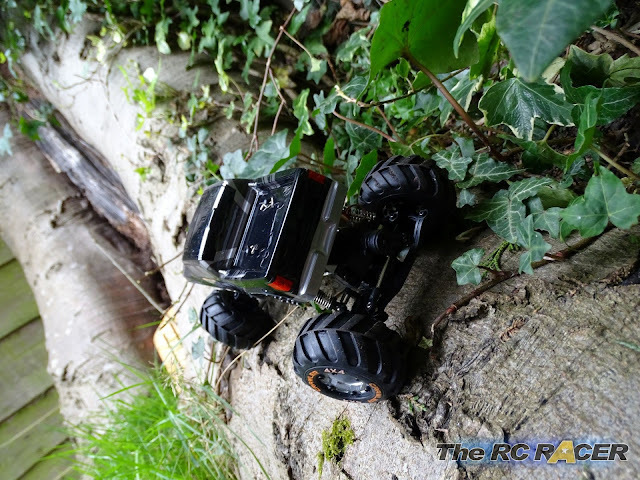 The rain had stopped and I was keen to get the Devastator out in the garden to see if it would be able to achieve any sort of off road performance. The truck has 33mm ground clearance but it was able to move over the trimmed grass with no problem. I steered it towards the corner of the garden where there is a pile of rocks from a failed garden landscaping attempt some years earlier. I approached the rocks and it started it's assent. Here I started to really see some of the benefit of changing the steering modes as the truck balanced on the edge of a rock and I wanted to turn it to reach onto the dirt. I had quite a few topples but each time I got a little further as I aimed to get the truck up the tree trunk. I found that the rear steer worked well at times when I wanted to get the Truck back on track if the front wheels had slipped when lifting the car. 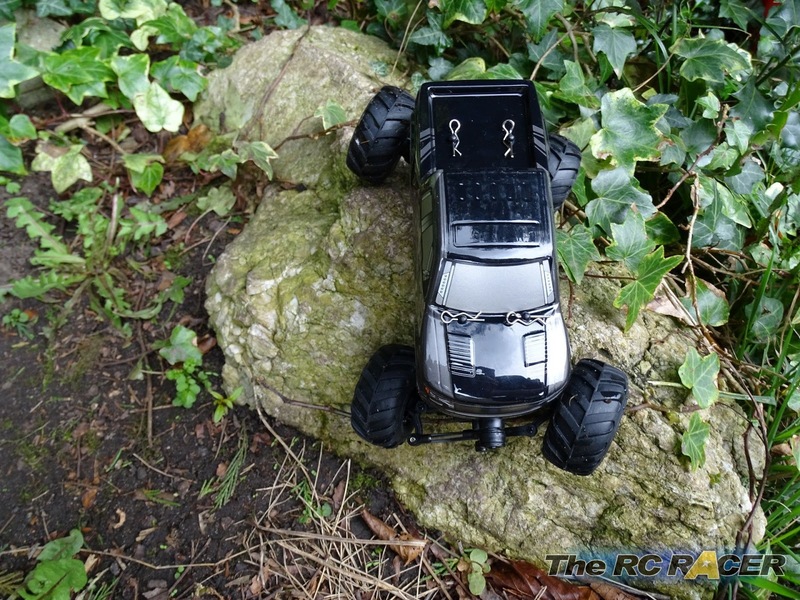 The crabbing worked to get the car around smaller obstacles that were blocking the main route, and the four wheel steer excelled when I didn't have much space to turn. Having these different modes available at the touch of a button was cool. I managed to get up some of the tree just as the rain returned. So as it is not waterproof (like me) I went back indoors impressed what this little truck could achieve. The Devastator is certainly something that I would not have thought could be so much fun. 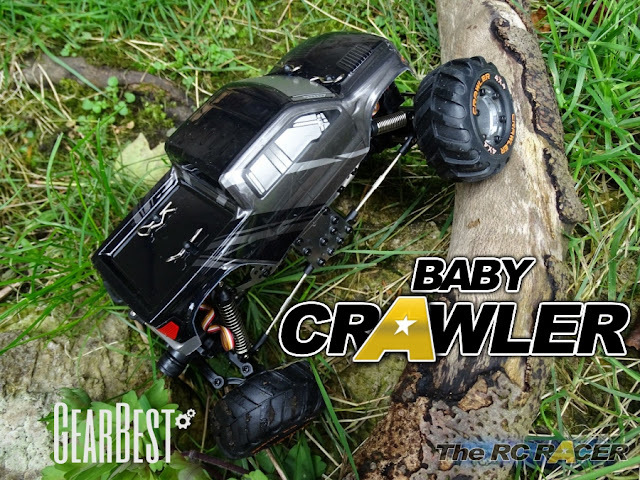 It is small and perfectly suited for indoor crawling, but it can also work well in the garden for some minor rock crawling action. 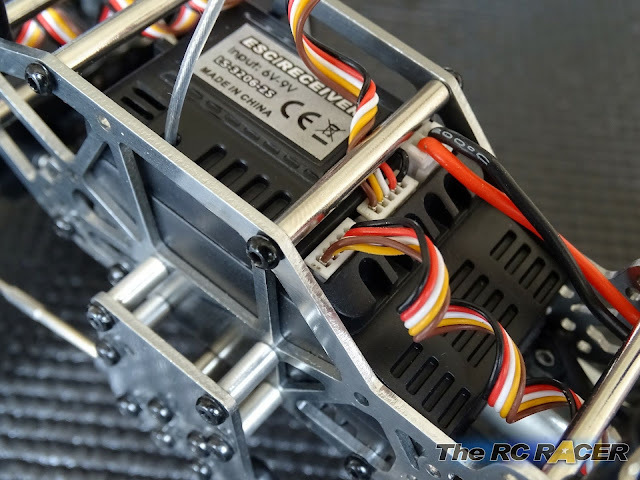 The aluminium chassis looks great and it feels well made, there is also a certain amount of adjustability available with different link attachments. The run time is impressive with 25-30 minutes being a lot of time available to mess about with it in a lunchbreak or messing around in the pit area between heats. After around 10 charges I have not had any issues with it. I would advise you to ensure that the screws are all tightened (I used threadlock on the screws that hold the links). One of the main issues is that the battery is integrated so you cannot just pop another in once it runs out. However after 30 mins you will be best to let the motor cool down anyway. Overall I have been impressed with the Devastator, it is something a little different with the 4 steering modes and the fact that you can make a course pretty much anywhere ensures that you are able to have fun indoors or out.